On Monday I woke up in Houston at 8:40 AM, left Annie’s place at 9:40, and walked to the bus stop on Chenevert and Pierce Street. I rode the 88 bus to the airport and boarded my flight to Denver at noon. My friend Dustin picked me up at 2:00 PM and he drove us back to his apartment which is about 3 miles south of downtown Denver. We hung out until 4:15 then walked to the light rail and rode it to the Union Station stop. 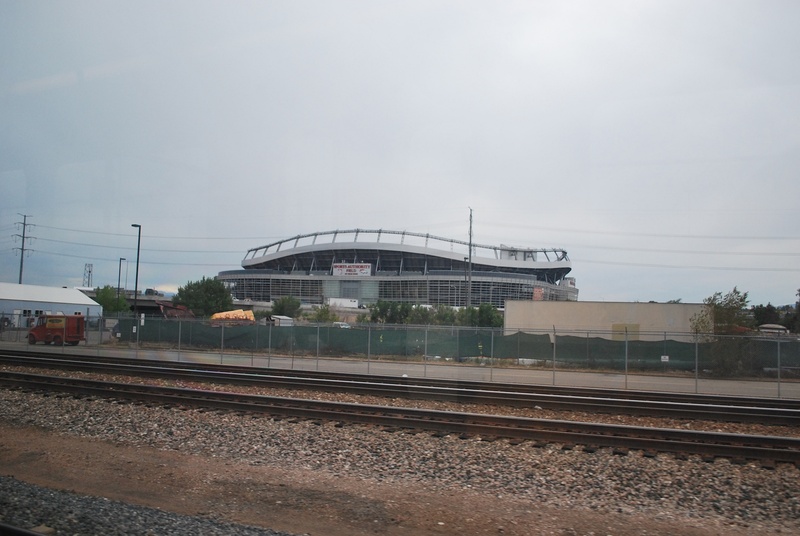 The light rail runs past the Broncos home, and I got a picture of Sports Authority Field at Mile High. 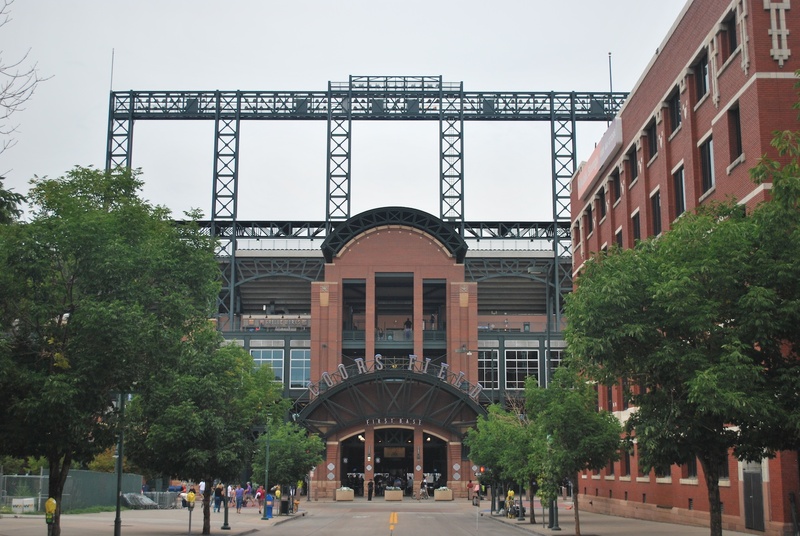 We stopped outside Coors Field on our way to dinner and got game photo number 114 out of the way. 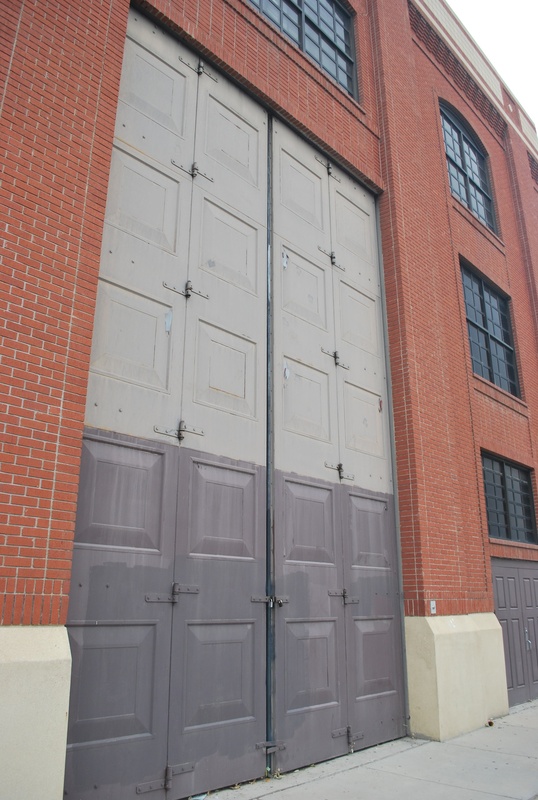 We passed a giant set of doors, I’m not sure what the purpose is, but they are tall. 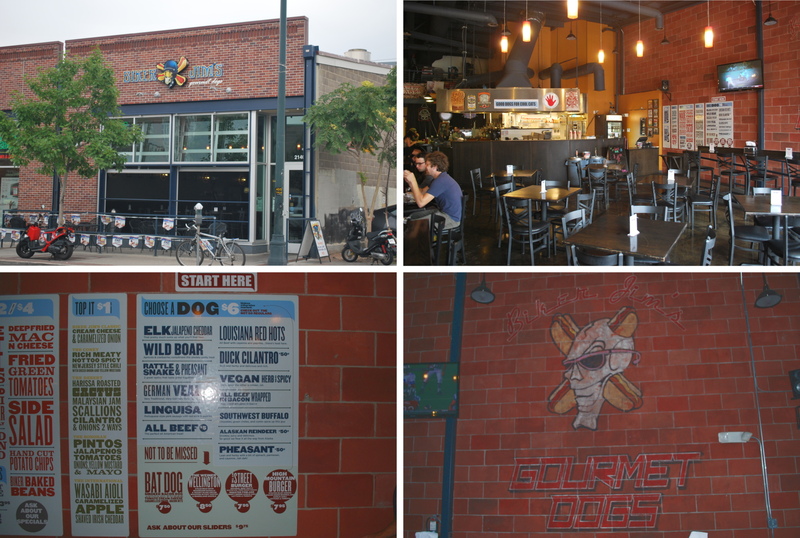 1) The exterior of the restaurant from across Larimer street. 3) Some artwork on the wall. 4) The menu, you can click the picture below to get a closer look and there are some very interesting sausages. 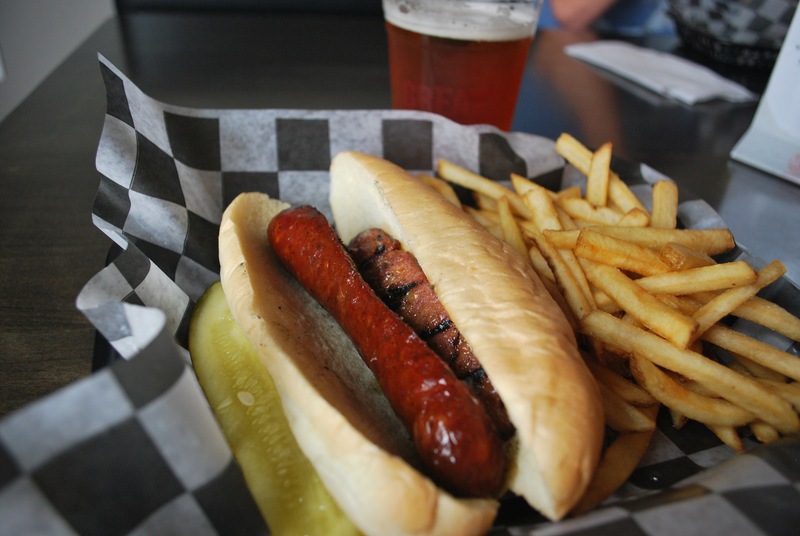 I had the Elk Jalapeño Cheddar sausage. I added ketchup, mustard and onions, but took the picture before doing so. It was a little tough, but overall it was good. I had Great Divide’s Titan IPA, which was delicious as well. Some people from our hometown came into Biker Jim’s when Dustin and I were eating and we chatted for a bit. They had told me they were going to the first two games of the series but I hadn’t told Dustin they had contacted me. He was a little more surprised than I was and it was nice to see some familiar faces. We actually wound up having tickets just two sections apart at the game, small world. 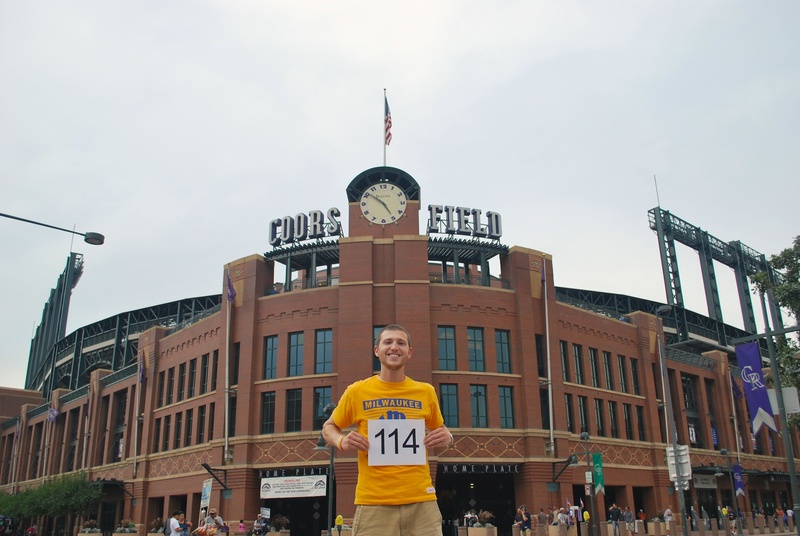 Dustin and I got to Coors Field at 5:55 and walked northwest on 21st street to get there. We went inside, purchased tickets for Tuesday’s game, and caught up with Joe Braun. 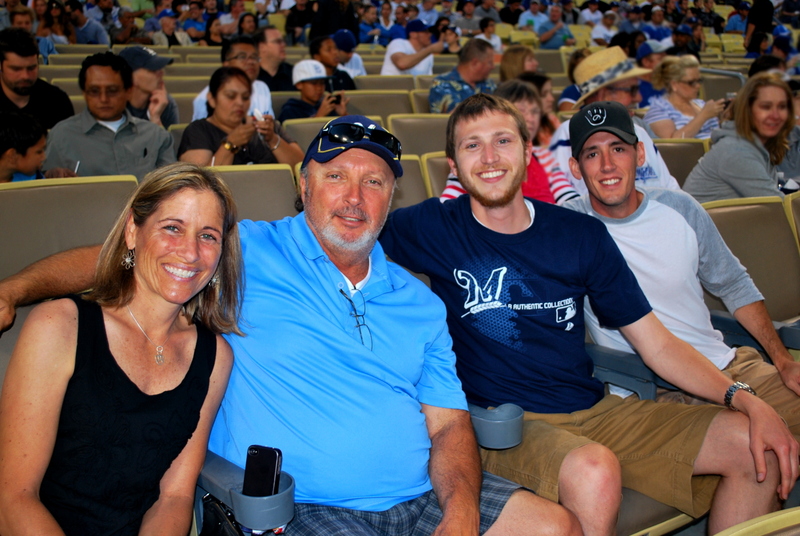 I had met Ryan’s dad in San Diego on April 30th and Dustin and I got to watch the final game of the Brewers-Dodgers series with him and Ryan’s mom in Los Angeles. It was probably the highlight of the year for me. If you weren’t reading the blog back then I’ve included the picture I had taken. We made it up to our seats in section 216 for the first pitch and it resulted in a groundout by Norichika Aoki. 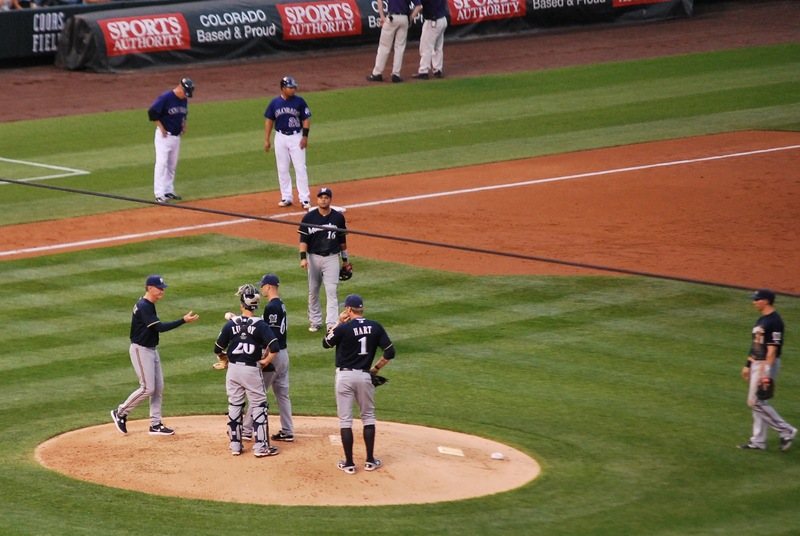 The Brewers went down 1-2-3 in the 1st and the Rockies didn’t follow suit, scoring three runs in the bottom half. In the 2nd inning the Rockies added another run and in the 3rd they tacked on four more. Mike Fiers started for the Brewers and all 8 runs were charged to him. 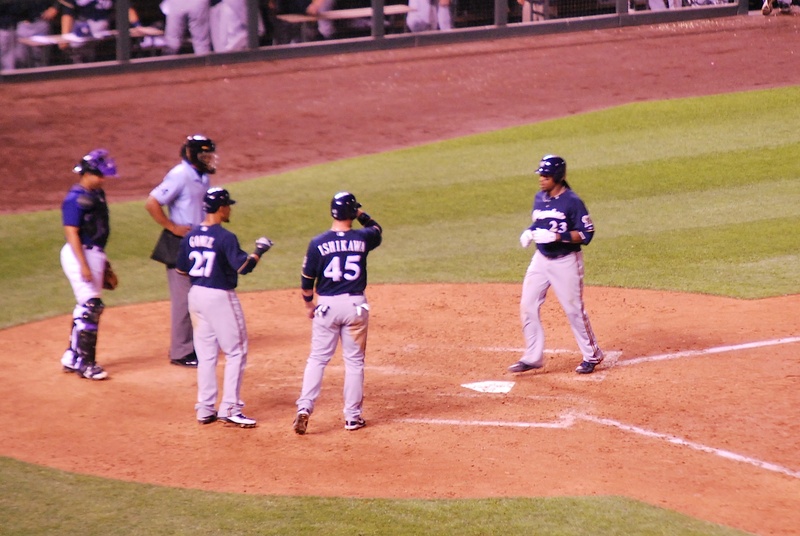 Roenicke pulled him after the first four men reached base in the inning. 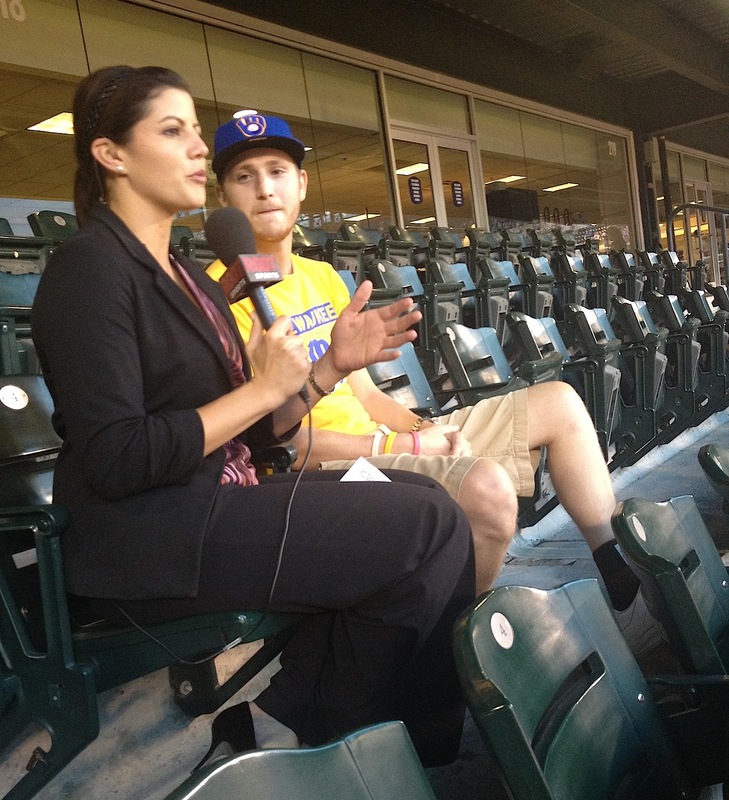 During the bottom of the 3rd Jenny Cavnar of Root Sports (the Rockies broadcast partner) stopped by for an interview. Since the half inning lasted so long she sat with us for 10-15 minutes, and I’m mad at myself for not telling her to ask about Be The Match. My job as the interviewee is to give them a question if there’s something I want to specifically talk about. We talked about me being a Leukemia survivor but I didn’t plug Be The Match at all, I honestly don’t know what I was thinking. I have to thank Root Sports for having me on, though, it wasn’t necessary but I definitely appreciate the coverage. Dustin took a picture of me during the interview. I do not know what I was doing, maybe making sure I didn’t have food on my joke of a mustache? I missed five pitches during the interview but looked back at the field as the Brewers scored their first run of the game, cutting the deficit to 7 runs. 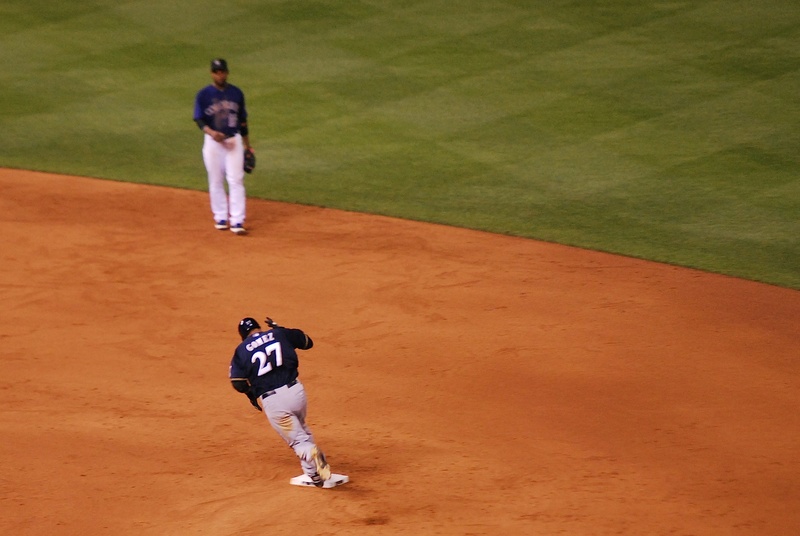 In the top of the 6th Carlos Gomez hit a 2-run home run and raced around the bases as always. 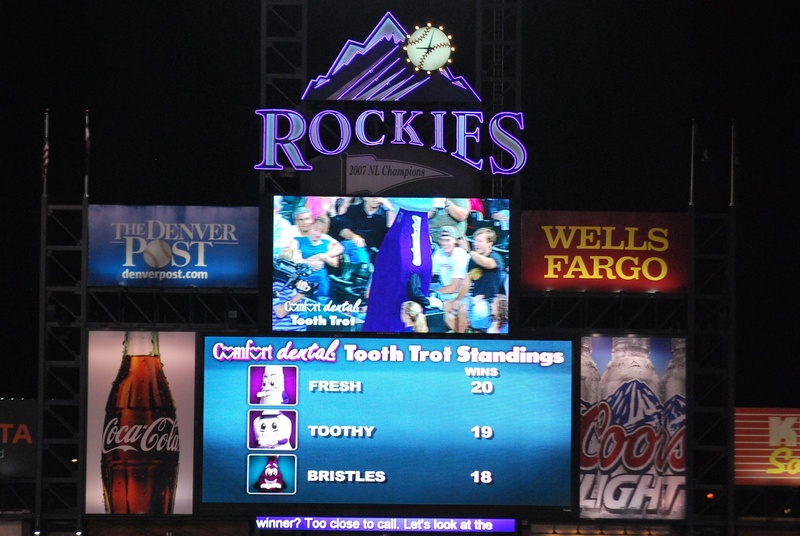 At Coors Field they run the Comfort Dental Tooth Trot, and it ain’t no sausage race. 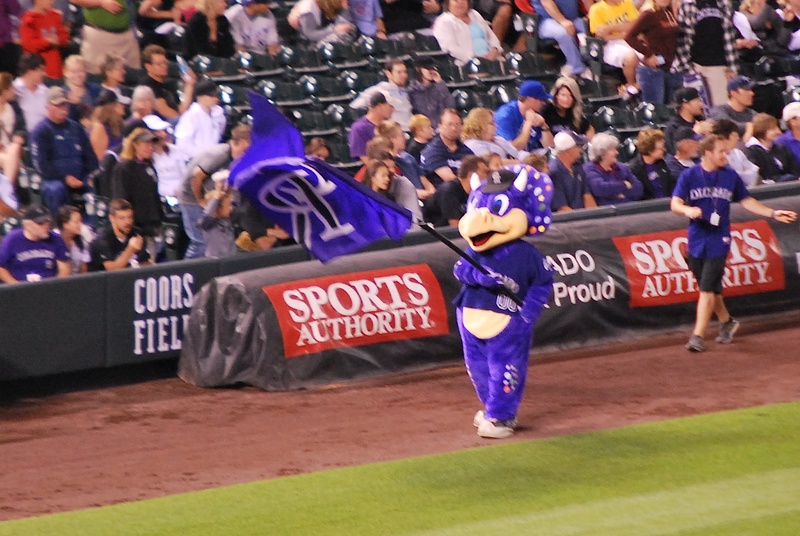 Dinger is the Rockies mascot, and he reminds me of Barney (no offense to Barney fans). 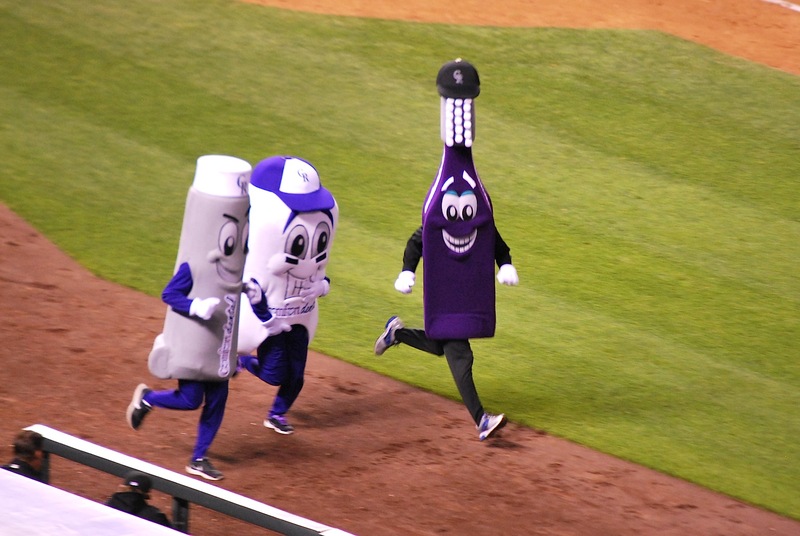 Dinger came out at the start of the race to wave the Rockies’ flag. 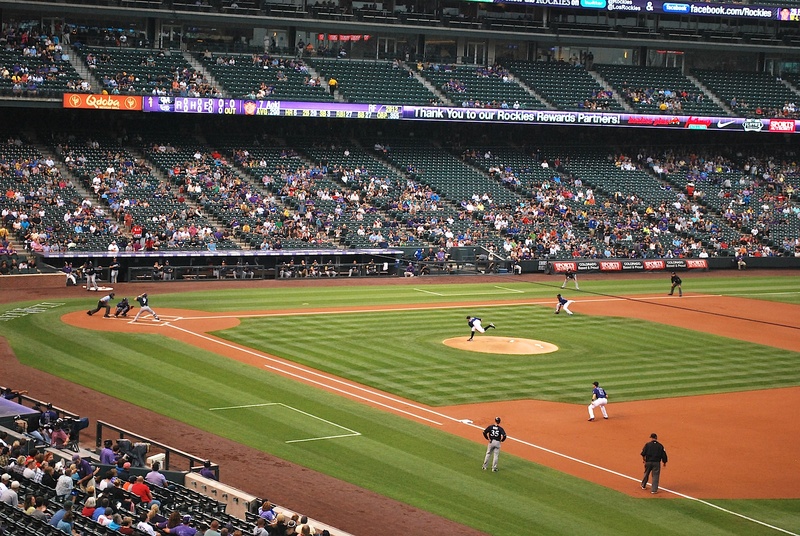 You may be wondering why a Dinosaur is the Rockies’ mascot. When they were constructing Coors Field they found dinosaur bones, including a 1,000 pound triceratops skull, thus the dinosaur mascot. The “Tooth Trot” itself pits a tooth, a toothbrush, and toothpaste against each other. Toothpaste was the eventual winner and the season stats are shown on the scoreboard afterwards. For all of you Brewers fans that don’t like the sausage race; it could be worse (even though brushing your teeth with a toothbrush and toothpaste is likely better for you than brushing them with sausages and ketchup). 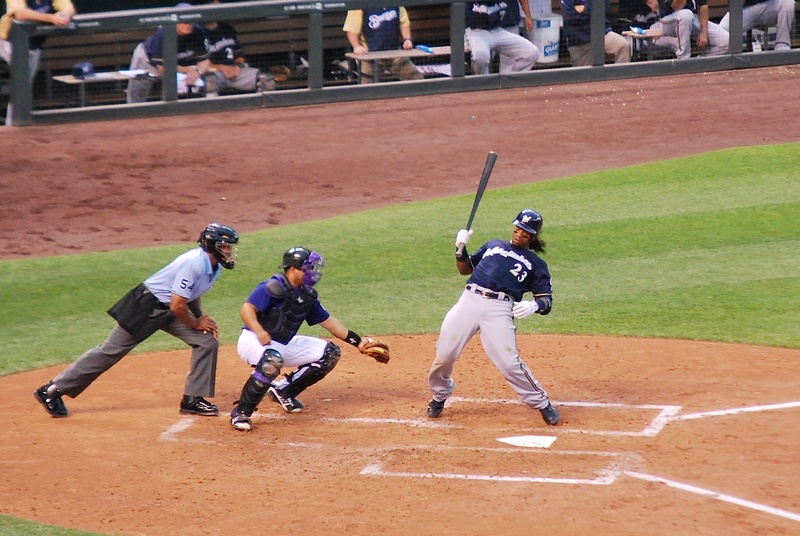 The Brewers gave up a run in the 7th and the Rockies led 9-3. In the 9th inning Gomez singled and Ishikawa was hit by a pitch. Weeks stepped to the plate with two outs and launched a home run to left center. Braun struck out to end the game and the Rockies took game one. Final Score: Rockies 9 – Brewers 6. 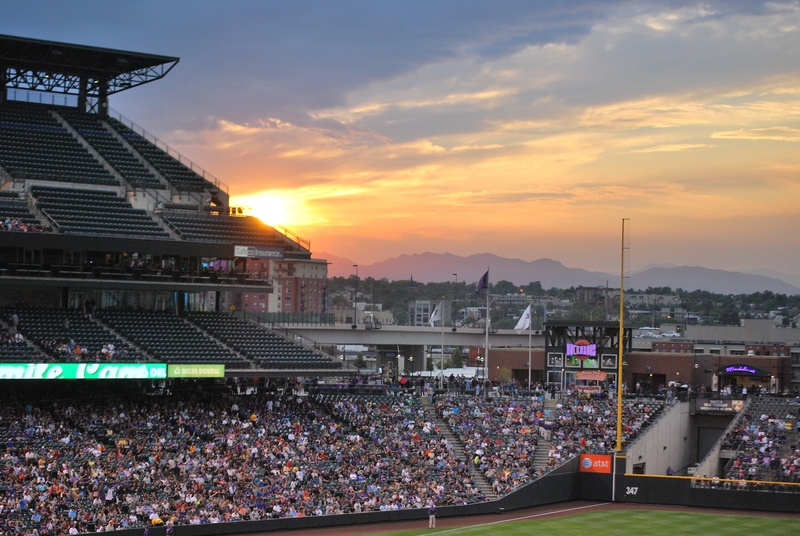 When the sun was setting earlier in the game I got a picture of it with the Rocky Mountains in the foreground. Not too shabby. One more picture. In the 3rd inning Jeff Francis, the Rockies starter, threw a pitch behind Rickie Weeks. He appears to be doing the limbo in the picture that I got. If only he could’ve somehow been holding the bat horizontally it would have been a more accurate representation of the dance.